Avoiding fingerprints on signs begins with a clean substrate to guarantee ink adhesion. Whether you are printing with UV or latex inks, the surface of your substrate must be maintained from unboxing until the substrate passes underneath the printhead and ink is applied to the surface. Several factors are key in insuring that surface adhesion properties (or surface energy), remain consistent throughout your production workflow. Let’s jump headfirst into the physics of solids (or sign substrates in this case). A solid actually has two major components; the body or bulk of the material, and the surface of the material. These items are differentiated by the amount of stored energy or “surface energy”, within them. The molecules constructing the bulk of a solid contains less naturally occurring energy than its surface molecules. Now that we have defined surface energy, we need to understand how liquids or inks interact with surface energy. Wetting is how a liquid disperses and bonds itself to a substrate surface and is dependent upon the surface energy. In physics terms, sign substrates are held together by “bonds”; making them a higher energy material that allows them to be more easily wetted than a material held together by “force”. High energy surfaces are more easily wet than low energy surfaces, as long as the surface energy is greater than the liquid’s molecular energy. In general, the ability of a substrate to anchor inks, coatings, or adhesives is directly related to its surface energy. If the substrate surface energy does not significantly exceed the surface tension of the fluid which is to cover it, wetting will be restricted and a poor bond will result. Clearly, surface energy must be assessed before printing, coating, or laminating is attempted. Now that we have a basic understanding of how surface energy works with sign substrates, let’s look at how touching a surface with the wrong glove or bare hands can impact surface energy. We now know that a substrates surface contains a specific amount of energy while at rest. When we touch a surface with an incorrect glove or bare skin, it actually lowers surface energy below an ink’s molecular energy level. The touched area now becomes a non-wetting enabled surface and will not allow ink to adhere properly. Non-wetting ink droplets can now easily disperse and spread across the surface, pooling into areas where energy allows wetting. We see this effect as a smudge or fingerprint that is lighter than the area around it, simply because the inks cannot adhere to where the surface energy has changed. Diminished surface energy preventing ink adhesion causing fingerprints on sign substrates. 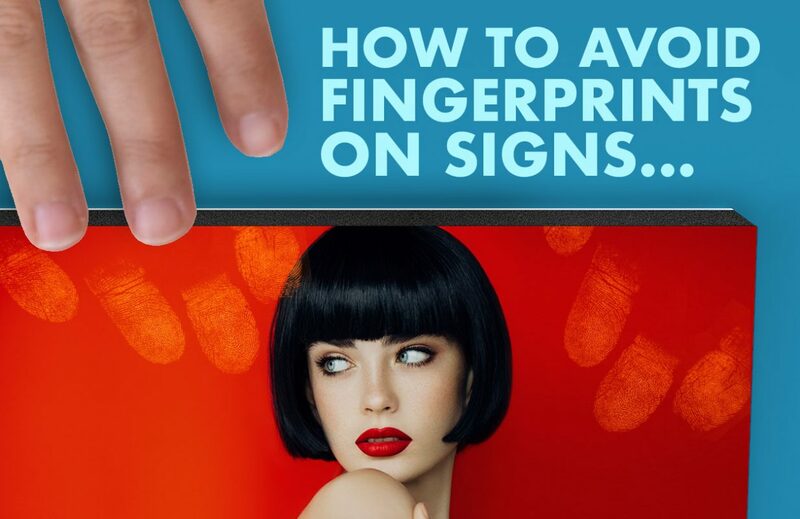 How Do I Prevent Fingerprints When Printing Sign Substrates? Now that we understand surface energy and how it effects our print results, let’s address how to prevent it. How? It is relatively simple- don’t touch your sign substrate surface with something that will change the surface energy. So simple- right? Yet we keep seeing print after print trashed because of a handprint or smudge; even in print environments where gloves are being used. What’s the problem? The gloves! Are the gloves cotton or porous where oils and moisture can seep through within a short time? Are they manufactured using a mold that may have silicone lubricants applied for easy release; resulting in contamination of the glove surface. Do the gloves have a powder or residue that can contaminate your print surface? Are they manufactured in an environment that causes a static charge or energy to be present in the glove? Looking at the questions above, we can quickly see that not just any old glove will do. You will need to consistently use a cleanroom quality glove that will not only prevent surface contaminants, but avoids disruption of your substrate’s surface energy. What Is a Good Glove for Digital Printing? After extensive testing within our production facilities, we have developed an excellent ISO standard clean glove that is ideal for prepress production. UltraBoard Pure Clean Gloves have no surface contaminants from manufacturing processes and prevents moisture and oils from wicking to their surface after extended use. Pure Clean gloves are engineered for clean lab environments, and provides a static-free solution that does not impact surface energy when handling substrates. UltraBoard Pure Clean gloves allow for consistently blemish and fingerprint-free prints, job after job. Contact us, or locate your local UltraBoard distributor today to learn more about our Pure Clean Gloves! This entry was posted in Art Mounting, Commercial Signage, Digital Printing, Large Format Printing, Mounting Boards, Photo Mounting, Sign Business, Sign Design, Sign Supplies, Substrates and tagged blemishes, fingerprints, sign printing, signs, substrates, surface energy, uv printing.